For more than 500 years St. John's has been visited by European explorers, adventurers, soldiers and pirates. 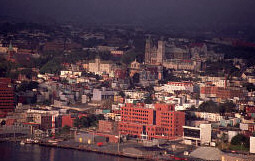 St. John's, the provincial capital, is the economic and cultural centre for Newfoundland and Labrador. The Rooms is a state-of-the-art cultural centre that preserves and protects the Newfoundlands heritage, history and culture. The Rooms houses the Newfoundland Museum, Provincial Archives of Newfoundland and Labrador and the Art Gallery of Newfoundland and Labrador. The Newfoundland Museum proudly displays three galleries which examines the natural history and native peoples of the Province. Check out Tales from the Vault, a changeable gallery where there's always something old that's new to see. The former train station, a magnificent heritage building, now a museum exhibits the 100 year history of the Newfoundland Railway and Coastal Boat services. Signal Hill has been the site of countless military endeavours over the centuries, and in 1901, was on the receiving end of the first transatlantic wireless signal by Marconi. Memorial University is Atlantic Canada's largest university with six faculties: arts, science, education, medicine, engineering applied science, business admin and seven schools: graduate studies, nursing, physical education/athletics, social work, continuing education, music and pharmacy. Anthropology and Archaeology, Applied Ethics, Aboriginal Studies, Canadian Studies, Classics, Creative Writing, Drama and Music, Economics, English Language and Literature, English as a Second Language, European Studies, Folklore, French and Spanish, Geographic Information Sciences, Geography, German and Russian, Heritage Resources, History, Humanities, Law and Society, Linguistics, Medieval Studies, Newfoundland Studies, Performance and Communications Media, Philosophy, Police Studies, Political Science, Professional Writing, Psychology, Religious Studies, Russian Studies, Sociology, Sociology/Anthropology and Women's Studies. Faculty of Science: Biochemistry, Biology, Chemistry, Computer Science, Earth Sciences Mathematics and Statistics, Physics and Physical Oceanography.